You know this place is serious about its food since they are the only gas station taco place that has a website – http://www.fuelcity-tacos.com/. 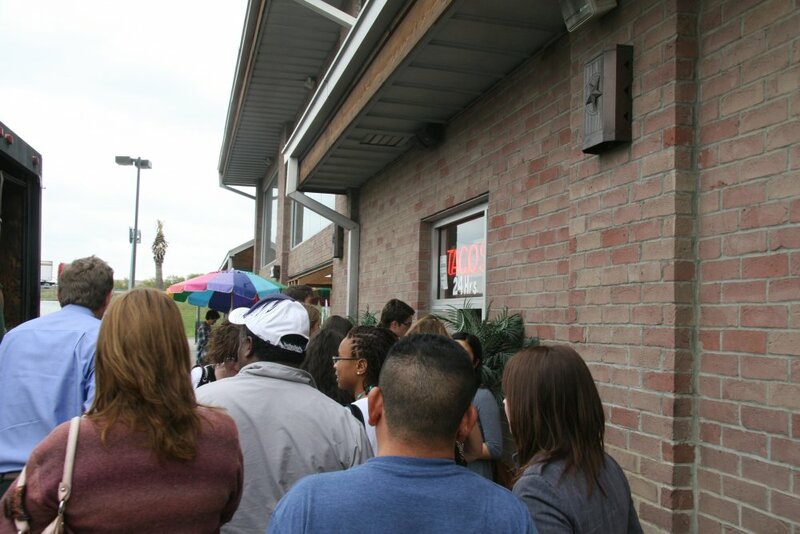 Plus they have taken several local awards including Best Tacos from Texas Monthly, Dallas Observer, and D Magazine. I went with my typical configuration: corn tortillas, diced onions, chopped cilantro, limes, and hot sauce. To accompany my taco assortment, I bought a can of “redneck Mountain Dew” also known as Sun Drop soda. First up the barbacoa, it has a decent flavor and is one of the better barbacoa tacos I’ve had at the Dallas gas station taco places. It’s not as slimy as some and the meat is quite lean. The flavor is not as strong as I could be which is unfortunate because it has the potential to be a really great taco, but I would pass up the barbacoa at Fuel City. My second taco test was the pastor (pork) taco which is rich in flavor and really is the best taco offered at Fuel City. 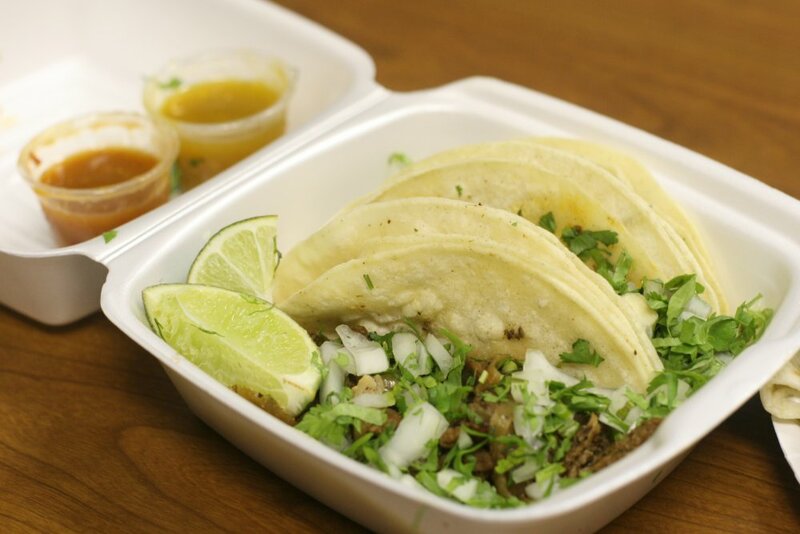 It has a rich flavor with a bit of heat that makes it a top quality pastor taco. 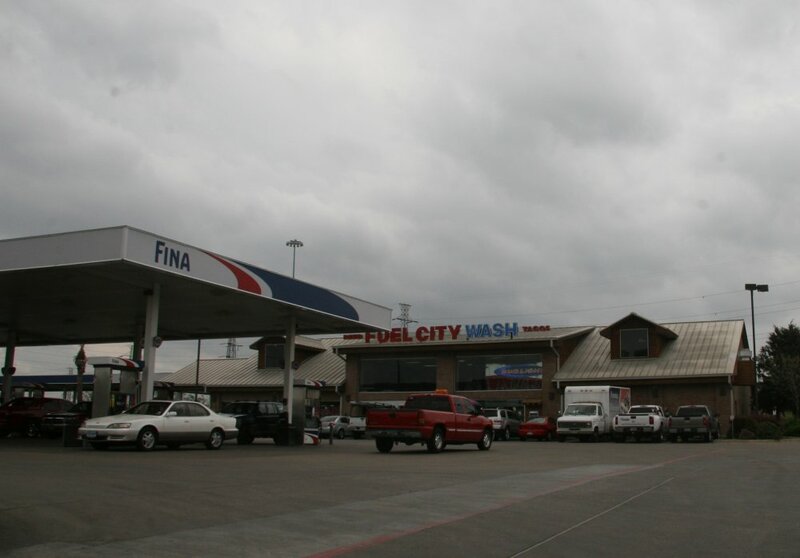 If you are seeking an excellent pork taco from the Dallas gas stations, Fuel City is worth the stop. The pastor provided the most complex and enjoyable flavor. It’s just too bad that Fuel City uses a flavorless corn tortilla. Perhaps the pastor in a flour tortilla is the best choice. Next up was the beef fajita taco. It lacked the rich flavor found at several gas station stops I’ve made recently. In fact, if you want a really excellent beef fajita taco, the Valero gas station about a mile or two from Fuel City is the better choice. Unfortunately, there just isn’t a lot of flavor in the meat offered here. It’s too bad after enjoying a very flavorful pastor taco to bite into a rather boring beef taco. I tried the chicken fajita taco next and it was far better than its beef fajita sibling. I really liked the chicken fajita taco since it several white pieces of chicken and was clear of any gristle or fat. The chicken tasted almost rotisserie in its flavor. It rivaled the rich flavor of the pastor but without the added spices the pastor meat has the chicken is still a second place finish for me. Lastly, I tried a taco style I had never experience before. Picadillo is described on the menu as a combination of ground beef with diced potatoes and green sauce. It was good and won the best taco in the State of Texas back in 2006 from Texas Monthly magazine. It didn’t really impress me much since the potato and ground beef combination lacked any real burst of flavor, but if you are looking for a milder, easier on the stomach gas station taco choice then the Picadillo taco is the one for you. It wasn’t greasy either and tasted great with the green hot sauce and onions and cilantro with a healthy squeeze of lime juice. I really wanted to love Fuel City since it is the closest gas station taco place near my work, but nothing here really blew me away and while I did enjoy the flavor of the pastor taco, the lack of a great corn tortilla and rather weak hot sauces didn’t make me crave it. Fortunately, my opinion probably doesn’t matter as I saw quite a line at the outside and inside windows the afternoon I stopped by and their recent mention in the Wall Street Journal and Dallas News are giving gas station tacos some well-deserved attention and that in itself is the value Fuel City adds to this odd segment of taco stands.